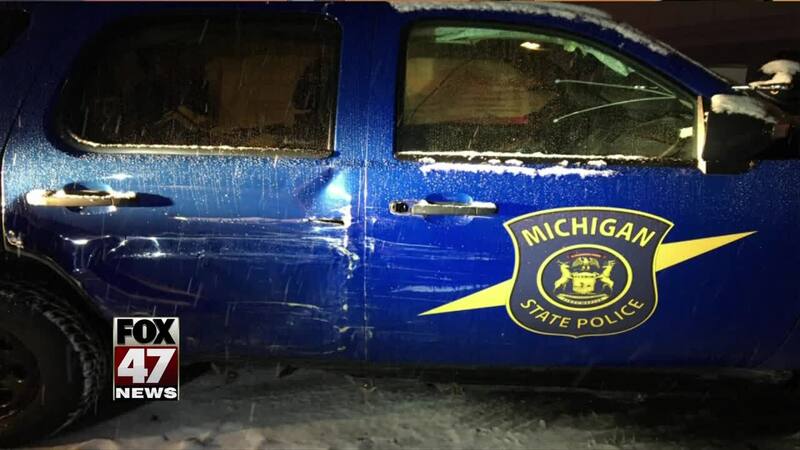 Two Michigan State Police trooper vehicles were hit after responding to accidents on snowy freeways Sunday night. The first accident happened at 6:15 p.m. on southbound I-75 at Crooks Road in Troy, according to MSP Metro Detroit on Twitter . The trooper was at that location attempting to check on the driver of a 1999 Mercury that was blocking lanes. Before exiting his vehicle to check on that driver, a GMC Terrain failed to stop and side-swiped the trooper's vehicle. The vehicle was side-swiped again on the passenger side by another GMC Terrain shortly after. The trooper was transported to a local hospital, but his injuries do not appear to be serious, according to MSP Lieutenant Mike Shaw. The female driver and the male passenger of one of the Terrain's did not go to the hospital, but were checked out by EMS at the scene. The male driver of the other Terrain did not want treatment from either EMS or the hospital. Troy police closed southbound I-75 at Adams Road for several hours due to the crash. Another MSP vehicle was struck on southbound M-10 at Meyers in Detroit, according to MSP Metro Detroit on Twitter . The vehicle was rear-ended while on the scene of another accident. The trooper was outside the vehicle at the time of the crash and was uninjured. At the time of the first trooper-involved accident, Shaw said there were 20 calls for traffic accidents, "mostly spin outs (because of) people going too fast." MSP also said on Twitter at 8 p.m. there are 32 spin out crashes in the district.